After bursting your bubble about the "healthy" French diet by showing you their breakfasts and by telling you about their penchant for fast-food hamburgers, I must now lower the bar even further: the gouté, the mid-day snack given to children as school lets out, is a health-food nut's nightmare. When I bring cheese, nuts, and fresh fruit to the girls at pick-up time, I'm the salmon swimming upstream. When I bring out the fresh vegetables, hummus, and occasional tofu, I'm a complete freak. Walking around the streets around 4:30pm, 99% of the children are eating the chocolate-filled puff pastry pain au chocolat, Lu chocolate-topped cookies, or other combinations of bread and chocolate. 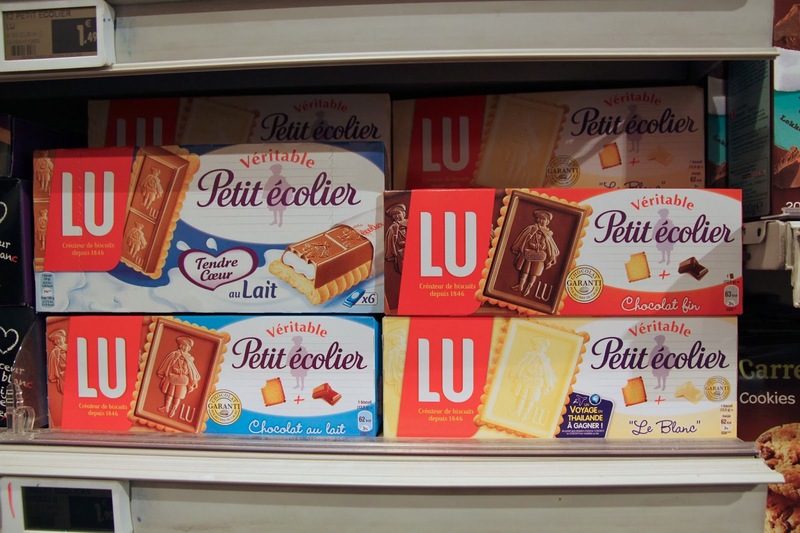 The Lulu cookies are even called -- appropriately enough -- "petit écolier" ("little student"). For official functions, group snacks, and school-sanctioned events, there is never even a slight nod to healthy foods. It is simply chocolates, sweet bready things, and candies. Lots of candy. Here, Pippa munches on artificially dyed marshmallows given to her after an arrondissement-sponsored public swimming event. Even the kids -- my kids that is -- find this shocking. Every Wednesday, Pippa has an extra-long gymnastics session that spans gouté time. Naturally, the children cannot miss gouté time. While adults virtually never snack and children are not allowed to snack at any other time of the day (virtually ever, anywhere, by anybody), gouté time is as sacred as a regular meal. The families take turns bringing in the snack. I generally bring in home-made cookies or muffins, along with fresh fruit and juice boxes. I don't consider this overly crunchy Californian. I mean it's not like I'm giving them seaweed-quinoa snacks or anything. But Pippa is regularly mortified. 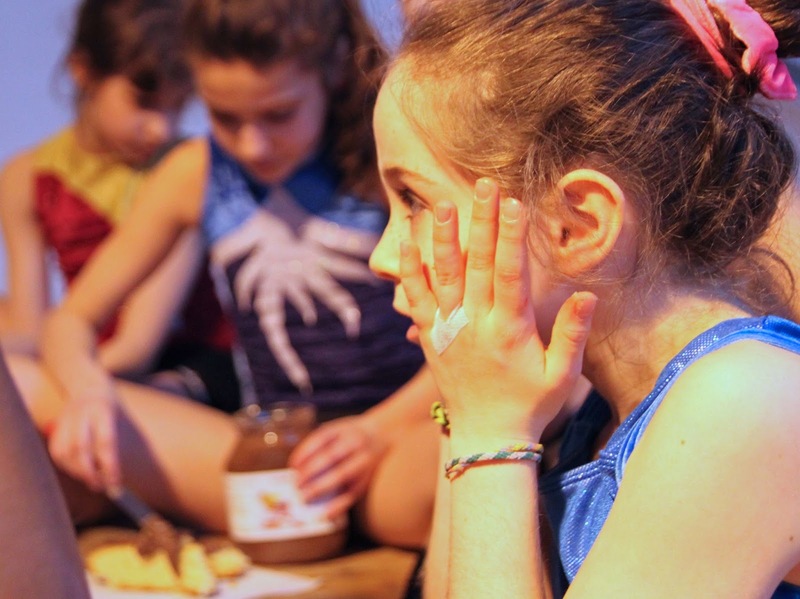 Then, after practice, she always tells me in a very relieved voice that everybody loved the home-made treats and that the girls lunged -- fought over even -- the fresh fruit. It never fails, yet the next time, when I refuse to put in goody bags of candy, she is mortified all over again. You think I'm exaggerating? This is the snack brought in by the coach herself: juice boxes, home-made cake with nutella to spread on it, and a bag of chewy candies. When I was a camp counselor in southern France during college, we used to feed the children snacks of baguettes and chocolate bars, and they would make their own poor man's pain au chocolat (probably where the pastry got both the inspiration and the name). It turns out bread and a hunk of chocolate on top is a real snack -- still eaten today by school kids on their way home. 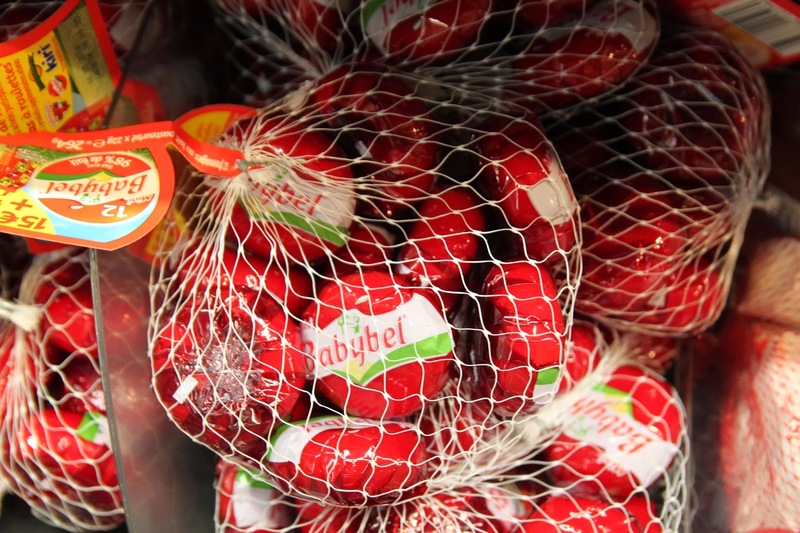 Of all the cheeses sold in France, and of all that I will mention this year, I suspect Mini-Babybel is actually the most recognizable. It barely even seems French. In fact, once you cut through the netting, then unwrap the plastic wrapper, you get to the red waxy interior that you peel away to get to the sticky pasteurized cow's milk cheese ball in the middle. The cheese most resembles the American, industrial, rather bland versions of Gouda or Edam, both Dutch cheeses. Each mini Babybel easily fits in the palm of a child's hand, which is the point of course. The brand was created in 1931 locally then extended regionally in 1952 and nationally in 1964. The mini size was created in 1977. There are also non-red, non-cow versions, like most recently a Gouda version in yellow wax with orange plastic that has been sold since 2013. Other flavors and colors, which vary with country, are goat cheese in green wax, and Cheddar in purple. It was their Emmental version that recently got them in trouble, however: in 2012, it inspired the slogan they included with the little prizes that come in the bags encouraging people to have "des vacances de malade mental", meaning have a "vacation like the mentally ill". It was supposed to be a play on words: mental/Emmental. Babybel was threatened with a major boycott and received a lot of bad publicity before they relented and ended the campaign. Yet Babybel is about a French a cheese as it gets -- just on the low-end of the scale. The photo below is not actually from a cheese store, but rather a book store, where various industrial cheese-shaped cookbooks are displayed. Want to know how to cook with Babybel? No, neither do I. That's why I take the photo but don't buy the book. Babybel is clearly meant as snack food for kids. It's available in the snack-cheese section at all the supermarkets. Yet interestingly, I don't see any French kids actually snacking on it. Somebody must eat it, though, because it sure sells a lot. FYI: The title of this post is a pun, of sorts. Not only is it about a day goûter (pronounced "goo-TAY"), but also the French word "dégouté" means disgusted. 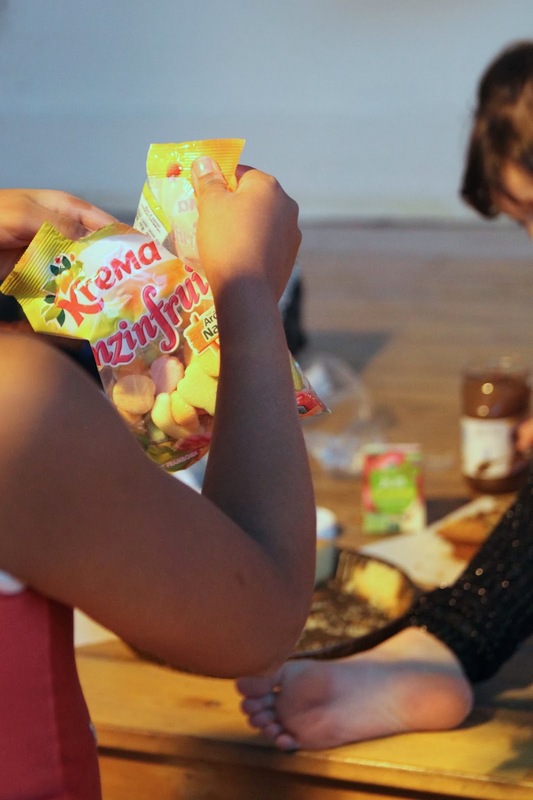 And, when it comes to the after school goûter, I kind of am.